Can a company be environmentally conscious and still make money? That might seem like a strange question, given that many of the most vigorous opponents of environmental regulations seem to come from the business world. But the experience of the UAE, Dubai in particular, in advancing a green agenda while engaging the corporate world in this transformation proves that not only is it possible to marry environmental initiatives with sustainable economic growth, it is a matter of the utmost urgency. Climate change is real and it is affecting the lives of millions of people around the globe. Experts and ‎pseudo-experts can debate how much human activity is directly responsible, but the unending stream of ‎news about record-breaking hurricanes, cyclones, and flooding; the unseasonable heat waves and the ‎monster blizzards means that whatever the causes, humanity is facing the consequences of changes to our eco-system. But ‎there are efforts being made to mitigate and perhaps reverse some of the worst damage we have ‎wrought on our planet. Efforts to make our lives happier, healthier and more productive should be acknowledged and celebrated. Signatories to the United Nations Sustainable Development Goals (SDGs) 2030 and the Paris Climate Agreement have tried to coordinate international efforts to promote sustainable development and to reduce carbon emissions. Although there is as yet no consensus on the actions that must be taken, some nations are going even further than the stipulations of these agreements. The UAE has been at the forefront of countries adopting forward-thinking policies to encourage the sustainable use of resources. Through the UAE 2021 Vision and the UAE 2030, the country has outlined a set of rigorous initiatives to move towards a green economy by diversifying income sources, moving away from a dependency on oil, and becoming a global hub for environmental products and technologies. The measures introduced to cover the energy, agriculture, investment, transport and construction sectors, and focus on environmental quality and sustainability. This arises from the UAE government’s conviction that long-term economic growth can only be guaranteed through environmental conservation and as well as green technology innovation. At the same time, Dubai has affirmed its ambition to become the green capital of the world by reducing carbon emissions, investing in green technology and renewable energy and by making the emirate a cleaner, greener, happier place. One area where we can see the direct correlation between environmental (green) business investment and profitability is in office fit out. We spend 90% of our time indoors and there are numerous benefits to health, well-being and productivity arising from having environmentally sustainable (Green) working spaces. It has been estimated that in the US buildings cause almost 40% of national carbon gas emissions due to their energy consumption. This is greater than both the industrial and transportation sectors. However, buildings which are constructed or remodelled taking into account the environmental and sustainability dimensions have 34% lower CO2 emissions, consume 25% less energy and 11% less water as well as producing significantly less non-recyclable waste. Less measurable, but no less importantly, employees of companies that have moved to an eco-friendly interior fit out report feeling happier and more positive about work. If you factor in the fact that employee costs typically account for 90% of operating costs, according to the WGBC, every 1% improvement in productivity can have a tremendous knock-on effect on any business’ bottom line. Other studies indicate that buildings which are designed taking environmental principles into account or that are retro-fitted have 20% lower maintenance costs than conventional commercial buildings. Green building retrofit projects can in some instances reduce operational costs by 10% within a single year! In another study, examining over 25 thousand US commercial properties, researchers found that rental, occupancy and pricing levels of eco-friendly buildings are significantly higher than for non-certified ones. Green buildings have a higher value not only because of increased energy efficiency but also because of improved water efficiency. The sustainable materials and resources used in fit out also have a great effect on rent levels as they are more attractive to potential tenants. At Summertown Interiors we practice what we preach, being the first fit out contractor in the UAE to receive the prestigious Gold LEED rating for its Jafza headquarters fit out in 2009. The LEED rating system created by the United States Green Building Council assesses the overall environmental performance of a building. After the fit out, it is estimated that the Summertown headquarters consumes 35% less energy, 50% less water and diverts 90% more of its waste from landfill compared to a conventional office building. In another recently completed project, the fit out of the Smart Dubai office, Summertown worked with DWP designers to ensure that the 1,850 square meter project not only met stringent green building standards but provided employees with an attractive and healthy working environment. Summertown was awarded the contract because of its 20-year history company fit out solutions ‎taking into account sustainability and environmental design, which put it far ahead of any competitors. 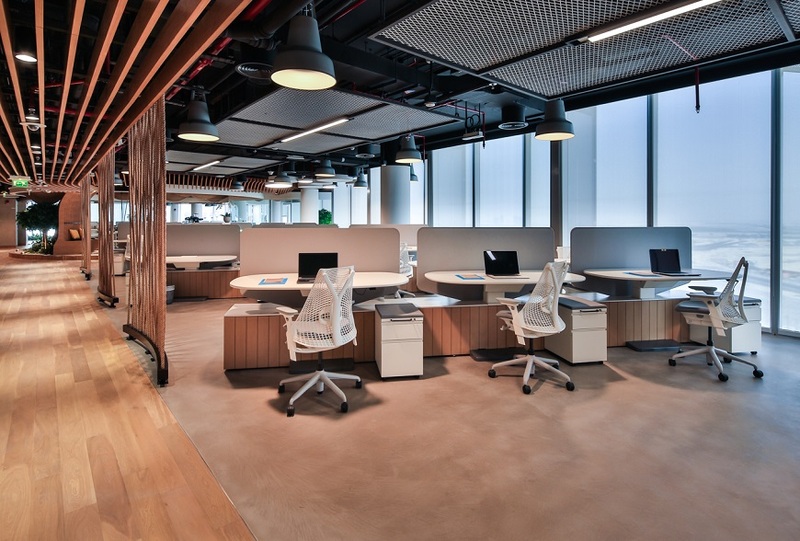 With a focus on promoting sustainable environmentally friendly development, the Smart Dubai office fit out relied on organic materials, including wood and rope, took into account air quality, energy consumption and lighting, in addition to some complex IT requirements. If you don’t currently work in a Green office, don’t you wish you did? And if you have not yet considered investing in an environmentally sustainable fit out of your business, isn’t it time that you did?